Yesterday afternoon, I discovered an option in the Control Panel Mouse settings that I hadn't seen before. I wondered if it might solve my touch pad problems. Below is a section of my Control Panel screen which I can access by first accessing the "charms," then clicking on the SETTINGS "charm," then clicking on "Control Panel." 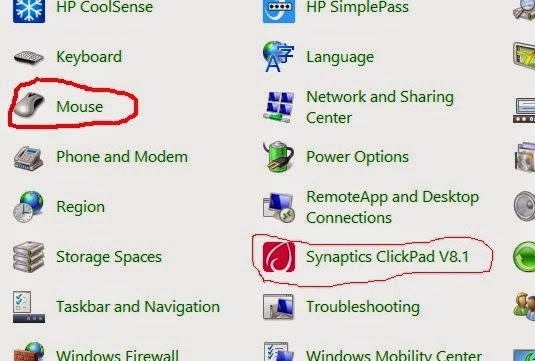 The settings of immediate interest in the Control Panel are for the Mouse and the touch pad (ClickPad), circled in red below. The option of interest is in the above graphic where I can put a check mark before "Disable internal pointing device when external pointing device is attached." Clearly, that option solves one problem I'm having with my touch pad (ClickPad). It allows me to turn off the touch pad when I'm using the mouse. That's a minor problem because I might accidentally touch the touch pad while typing. When I do that, it can change the place where the cursor is located. Instead of continuing to type at the bottom of the page, I might accidentally suddenly start typing in the middle of a word in the middle of the page. But my main problem is still that I am unable to use the touch pad when I do not also use the mouse. And that makes the touch pad virtually useless, since the only time I would generally want to use the touch pad is when I'm traveling or in some situation where using a mouse is inconvenient. 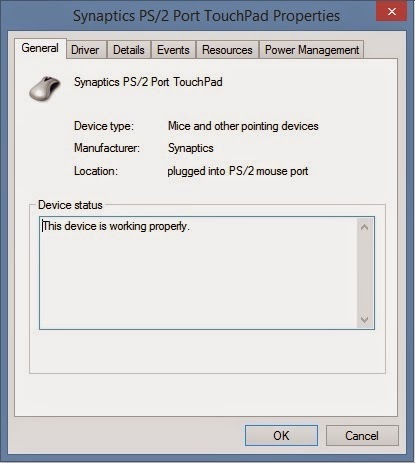 It appears that if I do not turn on the mouse before turning on my computer, the touch pad will not work. Go to part one of this topic (click HERE) for a history of the problem. 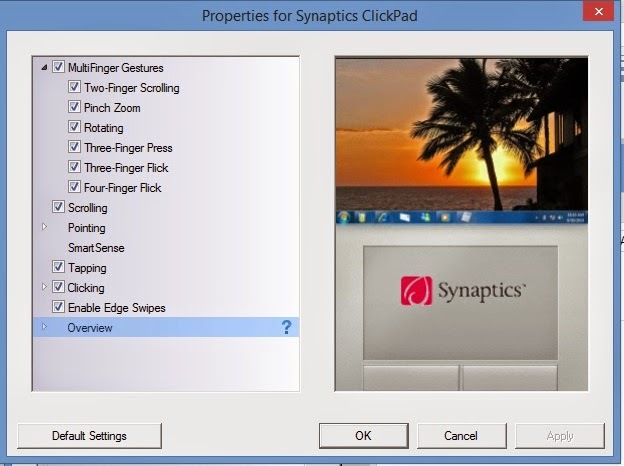 When I clicked on the box before the "Disable internal pointing device" option, it immediately disabled the touch pad. So, I know I can solve the minor problem I have with my touch pad. But, when I detached the mouse, the touch pad did NOT turn on. Nor did the touch pad turn on when I closed my computer and restarted it again without the mouse attached. The only way to effectively use the computer was to connect the mouse again. Then I can use both the mouse and the touch pad. The purpose of this blog entry is to describe the current situation. Next, I'm going to see if the touch pad will turn on if I turn on the computer first and then test to see if the touch pad works while the mouse is still turned off. In the past, it did NOT work. But I didn't make sure to go through the same steps every time I tried it. I'll also try it with the mouse completely disconnected. Instead of updating this text to reflect test results, I'll add the test results as comments below. I'll continue leaving the mouse off until I've turned on the computer and tested to see if the touch pad works. The only change will be the change in the switches as shown above. Everything seems to be working okay now (Sunday, Feb. 22, 2015). The problem is: I'm not sure exactly what caused things to work. I learned that disconnecting devices while the laptop computer is "asleep" (i.e., the lid is closed) will have different results than disconnecting the same device while the laptop lid is open. Examples: Switching monitors (i.e., switching from the 23-inch monitor in my office to my TV in my living room while my laptop is "asleep" will cause the colors on the TV to be totally wrong. I have to disconnect the TV and reconnect while the laptop is open to get the right colors. 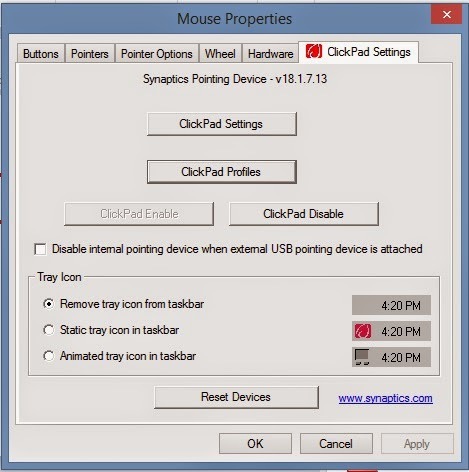 Also, simply pulling out the mouse transmitter from the USB port will not always automatically turn on the touch pad. I may have to close the lid and reopen the lid to get the touch pad to work. It seems that there are just too many options and too many ways of doing things to be certain that everything will work no matter when you turn something on or off. But, as of this moment, my touch pad works and so does the "two finger scroll" option. The switch is set so it will ONLY work when the mouse is turned off. And that is fine with me. End of story ------- for now. CORRECTION: "End of story" for a few hours. When I tried use the touch pad in the afternoon, there didn't appear to be any way to make it work. Pulling out the transmitter tab for the mouse before closing the lid didn't do it. Pulling out the transmitter tab for the mouse after closing the lid didn't do it. Closing and opening the lid on the computer while the tab was removed didn't do it. I went to the control panel switches for the touch pad, and none of them work -- probably because the touch pad is supposed to be off while the mouse is working. So, I went to the control panel switches for the mouse and turned off the switch that says the touch pad should be off when the mouse is off. It changed nothing. I turned that switch on again, pulled out the mouse transmitter tab, and nothing changed. The touch pad still doesn't work. I tried turning off the computer using the power switch after disconnecting the mouse. It affected nothing. I couldn't get the touch pad to work. At the moment (4 p.m. on Sunday, Feb. 22), I cannot think of any way to get the touch pad to work again. I'm back where I started. Or so I thought. But, on Monday morning, I pulled the mouse transmitter tab out of its USB socket and the touch pad was suddenly working again. Now the question is: What did I do differently on Monday morning than on Sunday? Why is the touch pad working (including the "two finger scroll" functions) today, but not yesterday afternoon? The only things I can think of are that there is either some set of events that have to happen in the right sequence, or that time is a factor, i.e., leaving the computer off overnight is somehow different from just shutting off the computer for a few minutes. 1. Turn on the large monitor. 2. Open the lid on the computer ("waking it up"). 3. Test to see if the touch pad works. 4. Turn on the mouse. Both times that I followed this procedure today, the touch pad did NOT turn on. That is consistent with past experiences. I'll do it a few more times before altering the procedure in some way (like removing the transmitter from the USB port or changing the "disable internal pointing device" switch). I noticed that the large monitor activated, instead of my laptop's monitor. When I was turning on the mouse first, the laptop monitor would usually activate first, and I'd have to press F4 to shift to the large 23-inch monitor. I also accessed the device manager and it showed that the touch pad is "working properly," even though it isn't working at all. On Friday morning, things worked the same way. The touch pad would not work if I tried it before turning on the mouse. And it wouldn't work after turning on the mouse. On Friday afternoon, things worked the same way. The touch pad would not work if I tried it before turning on the mouse. AND it still wouldn't work after turning on the mouse. So, I've changed some switches in the touch pad control panel (I turned the "two finger scroll and similar options back on. See the comments I added to the text at the top of this thread). I'll see if that affects anything when I turn on my computer tomorrow morning. On Saturday morning, I turned on the mouse AFTER I turned on the computer and checked to verify that the touch pad wasn't working. It wasn't working. I also noted that the large monitor came on first. After completing my morning chores on the computer, I turned it off again. Then, about ten minutes later, I turned on the mouse, turned on the monitor, and then turned on the computer. Following the past pattern, the computer monitor came on first, and I had to press F4 to switch to the large 23-inch monitor. Also as expected, the touch pad worked when I tried it. And the two finger scroll also worked, because yesterday I'd set the switches for it to work. Then I went to the control panel and the settings for the MOUSE, where I turned on the switch that turns OFF the touch pad when the mouse is connected. It immediately turned off the touch pad. I then turned off the mouse, I pulled the transmitter out of the USB port, and I tried the touch pad. It WORKED. The two finger scroll also worked. So, I CAN operate the touch pad when the mouse is not connected. Next, I plugged the transmitter back into the USB port and turned on the mouse. The mouse worked and the touch pad had stopped working (which is what was supposed to happen). So, at the moment, everything is working the way it is supposed to work. To verify that, I pulled the transmitter out of the USB port and the touch pad immediately started working again. Since I much prefer using the mouse, I once again plugged in the transmitter, causing the mouse to work and the touch pad to stop working. The next test will be later today or tomorrow morning when I turn on my computer again. I'll see if turning on the mouse before turning on the computer changes anything. I just did another experiment. 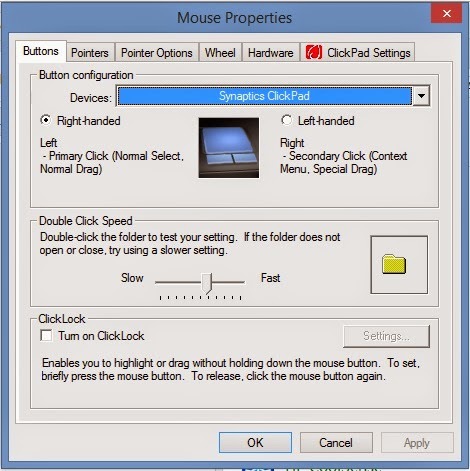 Turning off the mouse does NOT cause the touch pad to start working. Pulling out the mouse's transmitter from the USB port DOES cause the touch pad to start working. So, everything is still working as it is supposed to work. The only additional test I can think of to try is turning on the mouse before turning on the computer to see if that causes the mouse AND the touch pad to both work at the same time. I suspect it won't. I'll try that later today or tomorrow morning. The biggest chore right now is trying to understand HOW I fixed things. But, I better "knock wood," since things may stop working again. There aren't any more tests to do. One thing I learned yesterday is that making changes while my laptop is "asleep" can have unexpected results. For example, if the lid is closed (and the laptop is "asleep") when I disconnect the laptop from my 23-inch large monitor and take it into the living room and connect it to my 46-inch TV, all the colors will be wrong on the TV when I open the lid and "wake up" the computer. It will apparently not "know" that the monitor was changed. I need to disconnect the TV and reconnect it while the lid is open in order for it to "know" that a new monitor has been connected. This is probably related to the situation where I got different results if I turned on the mouse before opening the lid, versus after opening the lid. So, at the moment (Sunday a.m., Feb. 22), everything seems to be working as it is supposed to work. To verify that, I'm going to pull the mouse transmitter tab out of the USB socket right now. Well, that didn't "verify" anything. The touch pad did NOT start working as soon as I disconnected the mouse transmitter. I then disconnected the mouse transmitter AND closed the lid on the computer. When I opened the lid again, the touch pad was working. When I plugged the mouse transmitter tab back into the USB port, the touch pad immediately STOPPED working -- as it was supposed to do, according to the switch I set yesterday. So, once again, everything is working the way it is suppose to work. I just need to understand the sequence in which things have to be done. Yesterday afternoon, the touch pad refused to turn on when I disconnected the mouse transmitter tab. 1. I turned on the mouse. 2. I turned on the large monitor. 3. I opened the laptop lid. 4. The laptop monitor came on, not the large monitor. 5. After signing on, I pressed F4 and switched to the large monitor. 6. I did morning "chores," checking statistics, emails, etc. 7. I pulled the mouse transmitter tab out out of the USB port. 8. The touch pad (with "two finger scrolling") turned on immediately. 9. I put the mouse transmitter tab back in the USB port. 10. The touch pad stopped working immediately. 11. I wrote a comment for my web site about all this. 12. I again pulled the mouse transmitter tab from the USB port. 13. The touch pad again worked immediately. 14. I put the mouse transmitter tab back into the USB port. 15. The touch pad immediately stopped working. I can't think of anything that I might have done differently yesterday. But, it's possible I turned off the mouse before pulling out the transmitter tab or something like that. At least I know that things CAN be made to work again. In the past, closing a laptop lid puts it into "sleep" mode, without actually turning the computer off. Have you tried using the normal shutdown mode while testing different sequences to see if there is any difference? I'm not sure what "the normal shutdown mode" is. Everyone I know and everyone on TV seems to shut down their laptop computer by closing the lid. I have tried pressing the on-off switch to shut down the computer. It didn't seem to have any different effect on the touch pad problem. It just makes it necessary to start up all my various apps again. The same with going to the "charms," the SETTINGS and shutting down the computer there (and restarting). It didn't seem to have any different effect on the touch pad problem. I did all those things yesterday afternoon in an attempt to get the touch pad working again. None had any effect. There are so many options and so many ways of doing things that it's going to take a long time to check them all out. I KNOW I didn't turn off the power switch or use the SETTINGS method of turning off the computer last night. I just closed the lid. Yet, this morning I was able to turn on the touch pad. In the afternoon (Monday p.m.), I again pulled out the mouse transmitter tab to see if the touch pad would start working. It did. On Tuesday morning (Feb. 24), I pulled the mouse transmitter tab out of the USB port to see if the touch pad would turn on, and it did. That seems to mean I don't know and can't tell if I still have a problem or not. It APPEARS that the problem has gone away. The only time I would use the touch pad is when traveling, and I have no plans to do any traveling. I'm only worried that the touch pad won't work IF I suddenly find I need to travel and take my laptop along. The original problem with the touch pad was that the "two finger scroll" would stop working. But, I can get along with that. So, I'm not going to post any more updates until something happens to indicate that the touch pad won't reliably work when I absolutely NEED it to work. GROAN!! This afternoon (Feb. 25), I pulled the mouse transmitter tab out of its USB socket to see if the touch pad would turn on. It wouldn't. I don't know why, and I'm at a loss as to what further I can do to figure out what the problem is.